The measurement principle to derive model independent the neutrino mass is the high precision measurement of the kinetic energy of the beta electron from the Tritium beta decay. 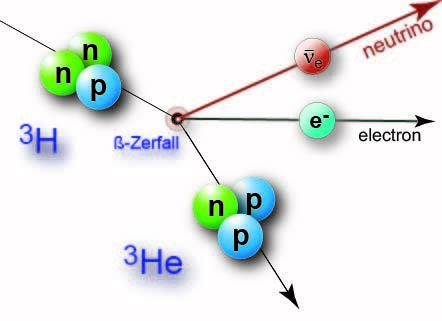 In the beta decay of Tritium to Helium an electron and anti-neutrino are released. They share together the released transition energy, which is distributed to their kinetic energies, the rest mass of the electron and- if the neutrino is massive - also to the rest mass of the neutrino. The subtle effect of the neutrino rest mass to the kinetic energy of the electron is largest, when the neutrino is non-relativistic i.e. 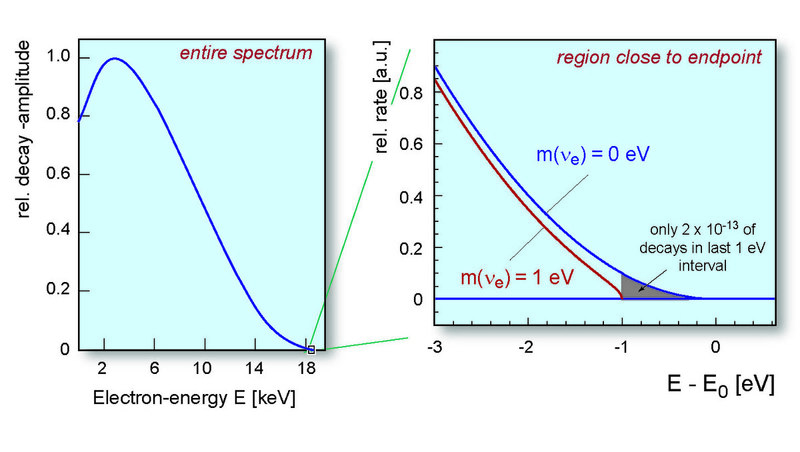 at the endpoint of the electron energy spectrum (see second figure on the left side). Therefore, a precision measurement of the electron energy very close to its endpoint gives information on the neutrino mass. The high sensitivity of the KATRIN experiments to analyze precisely the electrons kinetic energy will be reached by a special type of spectrometers, so-called MAC-E-Filters (Magnetic Adiabatic Collimation combined with an Electrostatic Filter). This type of spectrometer was first proposed in  and described in . It combines high luminosity and low background with a high energy resolution, both essential to measure the neutrino mass from the endpoint region of a beta decay spectrum. The main features of the MAC-E-Filter are illustrated here. Two superconducting solenoids are producing a magnetic guiding field B. The beta electrons, which are starting from the tritium source in the left solenoid into the forward hemisphere, are guided magnetically on a cyclotron motion around the magnetic field lines into the spectrometer, thus resulting in an accepted solid angle of up to 2 . Varying the electrostatic retarding potential allows to measure the beta spectrum in an integrating mode.